The space of the university provides an independent think tank for multi-dimensional investigations of architectural problems. 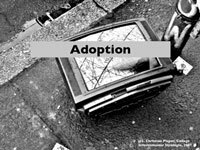 From 2010 to 2013, diverse strategies like sustainable densification, transformation and re-interpretation of the existing have been experimented on in 16 workshops and the Master's thesis in ten different cities in wider Europe. The article introduces in the range of research topics, sketches the key concepts from project work, design reflection and terms like 'interdisciplinary problem solving' or 'cumulative research by design' and presents the frame of Master programme's didactics through the workshop guide. In total, the third volume of the publication contains 12 books within the book. 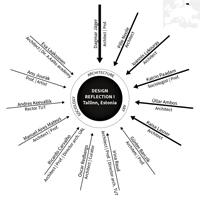 Each of the books – so called workshop cluster – contains the workshop programme(s), the professors' reflections about didactic goals, methods and qualities of architectural research by and about design and finally the results of the students. To introduce the volume, the key aspects of the partnerships (basics of the cooperation contracts between the universities) within the frame of the Master' s programme will be outlined first. 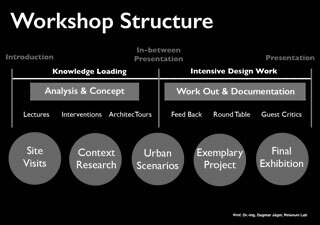 The workshop guide will give you an insight into the qualities of the research by design and its key terms that have been agreed by all workshop responsible professors. And finally you will find a recommendation of "How to read the Volume:III". The contributions of this volume refer to a period of two years. 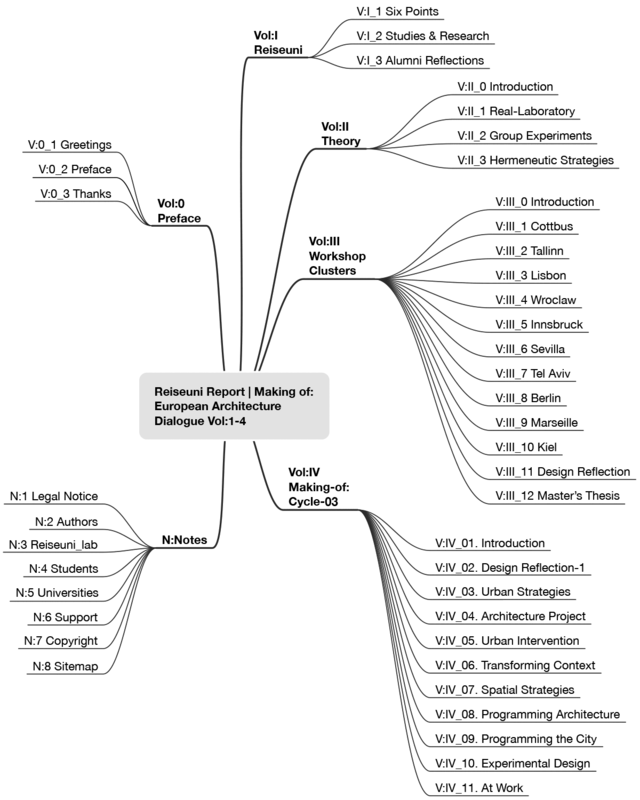 The twelve workshop clusters serve to document and reflect the work of the cooperative study programme between September 2010 to September 2012, showing the results of two classes during this period: one complete 2-year-cycle from the beginning to the end, including 8 project workshops, 3 design reflective workshops and the Master's thesis of all 19 participants and one half cycle of the second class, started in 2011. This second cycle is considered until the mid-term colloquium in Kiel. 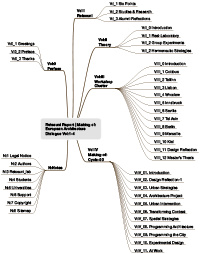 The objective is to include all structural elements of the pioneer Master's programme: by this choice, the workshops realized in 10 different cities and universities and throughout 16 workshops (class-01 & class-02), the 3 design reflection workshops and colloquia of the programme (class-01 & class-02) appear mostly in a sequence of the first and second class, to reflect the cumulative character of the approach or also the development of the programmes and results throughout the years. Each cluster represents one of the key research fields of the university and responsible professor: the 10 Workshop Cluster [Vol:III.1-10] – show project work as research by design in different cities of Europa and the workshop cluster Design Reflection [Vol:III.11], unfold the analysis of design experiences and methodology as research about design. The last volume [Vol:III.12] comprise the Master's Thesis – programmes, research methods of the cluster, reflection on the experience and results. The superordinate quality and network criteria as also the workshop guide have been developed stepwise from the beginning on along the Reiseuni-charter, the starting manifest of 2008. The partnership cooperation has first been prepared in a check list – the key document since 2008 about conditions, which have been relevant for the first meetings and later the partner contracts, as also for the development of the module catalogue. This catalogue contains binding regularities and contents of the Master's programme and had to be developed later for the accreditation process in Germany in 2009, then condensed in the study order. All documents made and still make transparent and contextualize the collective starting point, quality expectation and content of the study programme and research activities from the beginning on for all partners and (except the contracts) also for the students. 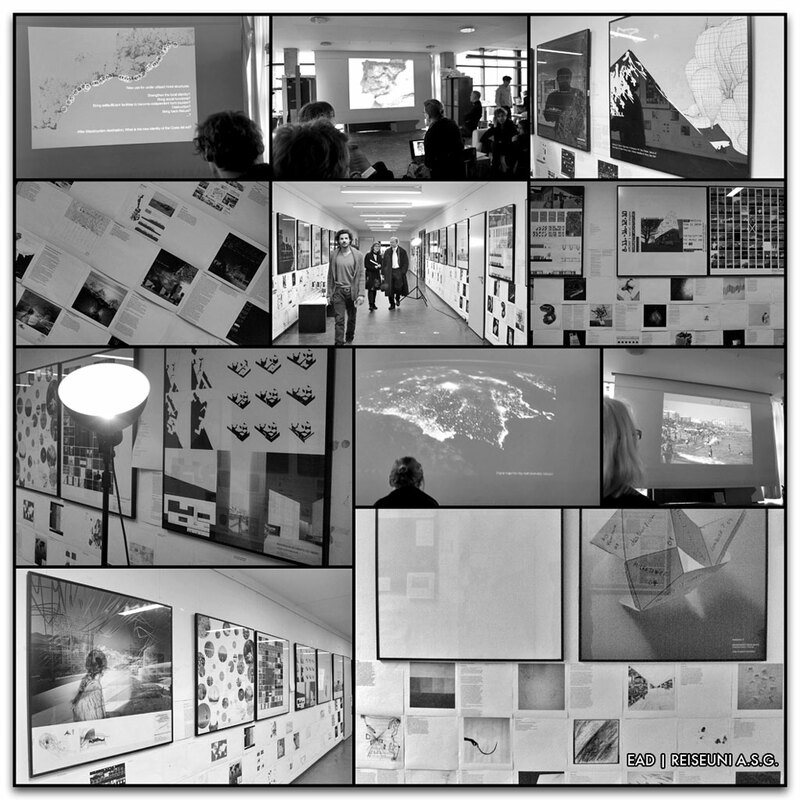 participation in the exchange through colloquia, conferences, reflective publications and in-between presentations, in the frame of the European Architecture Dialogue [EAD]. Part of the following text is a revised version of the module catalogue of the study programme which defines the key data, the quality and conditions of teaching, but at the same time the catalogue had to be most possible open and flexible for guaranteeing the liberty of teaching and the adoptability of relevant research of each partner university and partner professor of the Reiseuni_lab. Industrial areas and historical and difficult heritage sites out of function (see workshops in Cottbus, Kiel, Wroclaw and Master's thesis), modular settlements in state of repair or re-organization (see workshop Tallinn), devastated landscapes of exploitation (see workshops Innsbruck and Seville and Master's thesis), office buildings out of function (see workshop Cottbus) or inner urban lost or conflicted spaces (see workshops Berlin, Lisbon, Tel Aviv and Master's thesis) between infrastructures of mobility (see workshop Marseille). The river- and seafronts should be re-gained as public urban spaces by the civil society (see workshop Lisbon). Especially the collective destructions during and after war and industrialization, after 20th century's mobilization and urban sprawl, the wastage of resources and landscape and the multiple borders of modernity are important and challenging problems for the research-oriented project work of the workshop sessions. The workshops elaborate selected topics with an urgent local, but superordinate European relevance like heritage transformation, qualifying of tourism developments, developing urban waterfronts & infrastructure, which are often already part of the public discourses. The open problems are to be resolved by the interdisciplinary team of professors, external experts and the international student group in order to support the local municipalities and engaged stakeholders of the city. In the 16 documented workshops, localized task assignments are formulated in the so-called workshop programme and supervised by responsible professors and guest lecturers from the local institution of higher education. In the first part of the workshop, site visits, excursions, input lectures and interdisciplinary knowledge genesis initiate the project work. To introduce and focus the project work from multiple perspectives, professors, students and guest experts contribute individually in generating and/or presenting relevant knowledge in order to inform the whole research group. The acquired knowledge is shared via open sources, by ‚pin ups' (informal feedback and exhibition without representative, but with working character), seminar-like round tables and lectures. 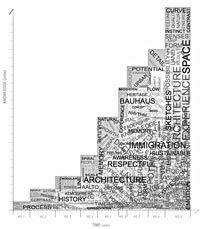 Parameters like case studies, collective mapping of plan material, analysis or artistic tracing of urban and building context, morphology, historic references are examined and evaluated. In a second period, the strategy of solution finding, concept development and scenario options are developed. Short-time design exercises (germ. Stegreif), brainstorming and round-table discussions should contribute to placing the focus on the key issues and to collect the possible field of topics and opportunities of design. Different design options are investigated in alternatives, e.g. by different teams of the study group. An interim presentation is implemented for a midterm critical session with guests. 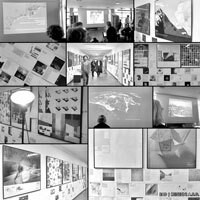 The first documentation, exhibition and discussion of in-between results serve for critical feedback, public debate, public local participation and knowledge exchange of ideas and working results of all participants. The third period is dedicated to work out and document the resulting positions: The exemplary elaboration, detailing and précising of one of the selected scenarios and design concepts, with continual feedback of the group and the professors, regarding the conditions and circumstances specific for the respective design. Finally, the results are prepared for viewing, presentation and& documentation in text and visual and physical representation to be discussed publicly at the respective higher education institution or the cooperating institution of governors on site. The workshops focus on relevant topics, which are of guiding cognitive interest for the responsible professor, for members of the institute, faculty, city or region and its' stakeholder. The students are invited for research by learning participation. The problem, question or approach represents a particular aspect of the research focus and has been progressed in interdisciplinary cooperation in accordance to the specific field of research. The question of the workshop has been developed in each academic rotation on the top of the previous results and experiences. The international group of students of each academic rotation has been working together with the team of professors of different disciplines of the faculties, with external local experts and – if possible – together with home students, on architectural and urban problems, to acquire a site-specific, interdisciplinary and multi-perspective knowhow about the facts, the history, cultural and political site-specific context and about diverse methods and approaches of problem-solving and architectural and urban qualities and case studies. 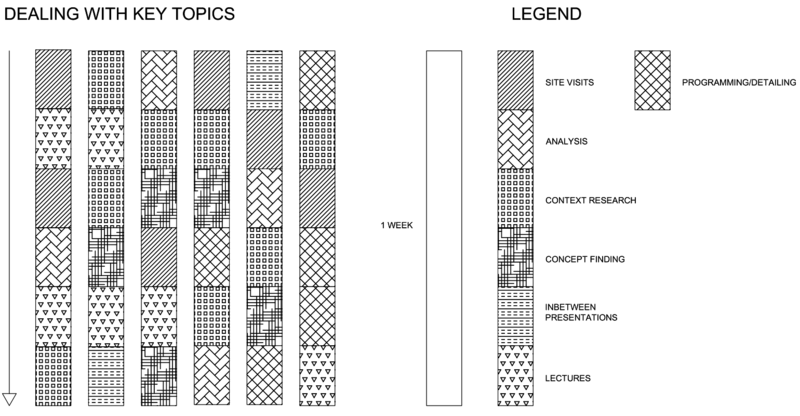 The learning effect for students is to carry out an independent and comprehensive investigation of a complex problem: The project-oriented workshops serve the students to practice on critically examining the given open questions, analysing the multidisciplinary contexts in order to define a strategy, a spatial programme, step-wise scenario or architectural and urban design solution within a specified period of time. With practical relevance, open questions are concretized in a cooperative knowledge-exchange and step-by-step manner. For this purpose, process-oriented and reflexive strategies, individual and collective design methods, communicative argumentation and diverse methods of decision-making have been chosen to develop a practice-related and coherent basis of discourse for the design task. The student will be able to select and generate required interdisciplinary knowledge within research groups, to establish a strategy, concept, functional (spatial or process oriented) programme and a multi-perspective solution for the given problem. Scientifically oriented methods and artistic strategies of analysis are investigated in theory and experienced and reflected along the individual project work to resolve the essential constructional, historical, economic, social, cultural or legal contexts of a design task. Especially during the workshops of Design Reflection the design methodological parameters of the task are investigated. Knowledge genesis is conceived via research about interdisciplinary contexts and case studies has been acquired as open research. Know-how about teamwork, experience with design strategies, programme developing, case study analysis as instrument of knowledge genesis and précising of individual positions has been trained. The praxis of developing and sharing the generated recognitions within the research group, implementing different formats have been trained in multiple scenarios. ArchitecTours – Excursions about architecture and town planning in the city and cultural contexts of the country accompany each workshop. The tool of sketchbook is introduced in the beginning of Design Methods and accompanies the research work of each workshop. The students experience various methods of presentation, documentation and communication in order to be able to describe, to visualize and communicate their approaches, reflections and solutions in a comprehensible manner to an audience. Critical feedback within the student group, with professors and external experts is conducive to reflective training and to strengthen students' self-responsible solution-finding capacity. The invitation of experts, professors of other institutions and non-academic guests serves as training of interdisciplinary communication skills towards clients or colleagues. 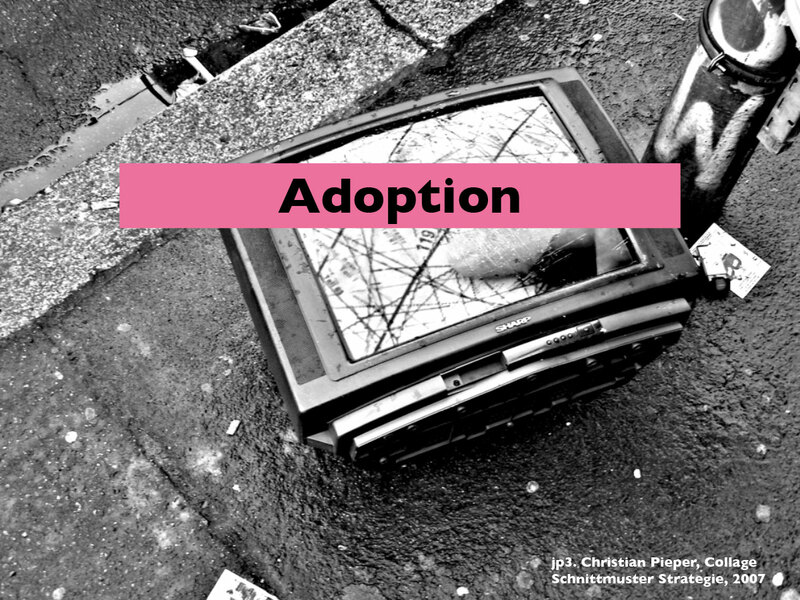 Presentations are accompanied by public exhibitions as a matter of public knowledge transfer to the local context of the city stakeholder. Working location of the workshops are the studios of the Institutions of Architecture, mostly situated in the historic city centres of the universities like in Tallinn, Breslau, Berlin, Lisbon, Kiel and Seville or on campus sites like Cottbus, Innsbruck or Marseille. The studios allow group work, intensive full day work and exchange in informal platforms of knowledge genesis, collectively available physical archives and meetings in order to learn from each other during the working process within the context of the university, in dialogue with home students ('vertical' exchange between different semesters) and by feedback during in-between presentations with the whole group. Volume:III is organized cluster-wise, per research focus of the partner, in chronological order (starting with the first appearance of the first city within the schedule of two rotations). 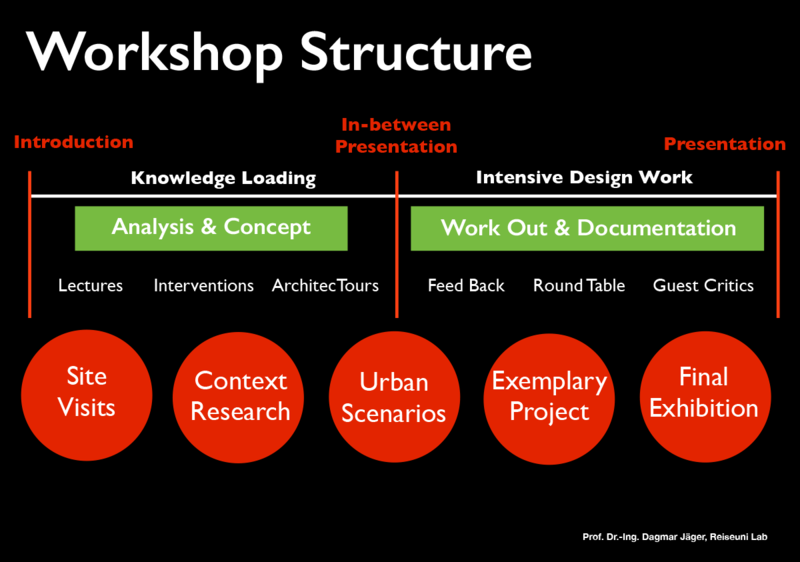 Each cluster shows up the research intention and special expertise of the professor: The workshop programme serves as instrument for guiding the group research work and enable later the comparative research about the design methodologies implemented in each workshop. After having realized the workshop, the programme documents the strategy, tools and disciplines as well as it is showing the persons-experts-stakeholder – the specific interdisciplinary team – involved, for dealing with each problem. It defines the methods and steps chosen, limits the choice of the problem-specific contexts of the research work in sense of problem explicit interdisciplinarity and documents the architectural tools and experimented group work constitution (by different group size, concerning change of groups during the work, strategies of group choice etc.). As in each workshop the students worked in different team constellations, mostly you find the individual results within changing team contexts, which also mostly means different intercultural group constellations. The reflections of the professors, which have been written in 2013, deal with the personal expectations and goals, outline the research fields within the local context, partly explain the traditions of the university and architectural schools, the local specific challenges of the city, urban and architectural contexts and finally conclude the individual experiences made during the work with the international group. You will find the reflective texts always at the beginning of the clusters of Volume:III (cluster Cottbus, Tallinn, Lisbon, Innsbruck, Seville, Berlin, Design Methods, Master thesis). The students' results are selected in accordance to the exhibitions, which took place during the studies together with the students. In most of the clusters, you will find the 5 best works which have been selected for the exhibitions. The results contain reduced and focused visual material but also short texts, written by the students themselves in the moderated frame of design methods 2, where we worked about critical reflection and communicating of design processes and work results. 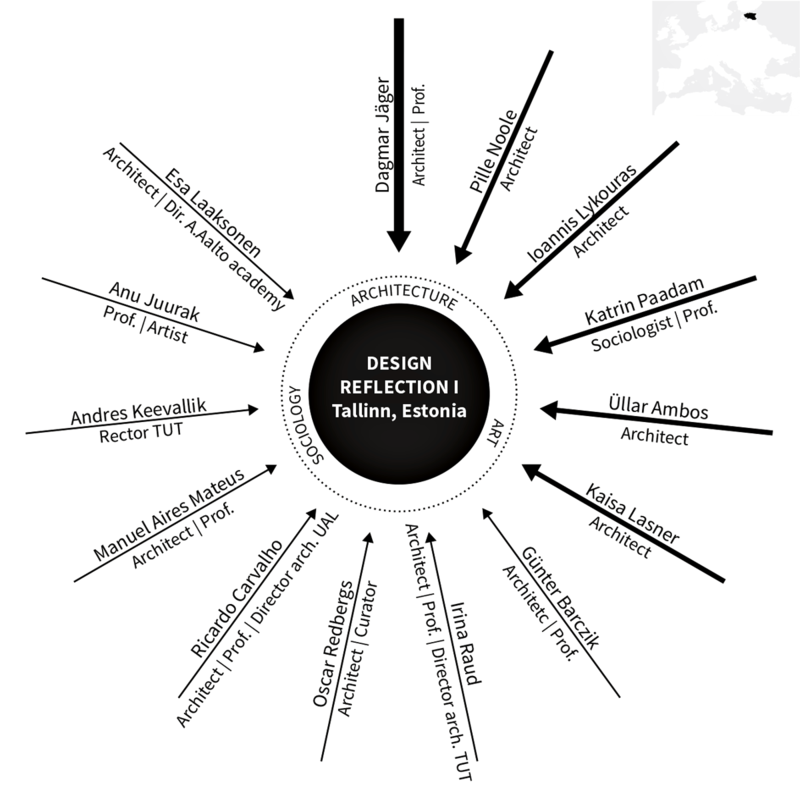 The articles of the alumni deal with the reflection of the whole programme experience, and have been written after the graduation and in preparation of the conference in Tallinn, the fifth European Architecture Dialogue in 2014. The Cluster Design Methods [Vol:III.11], exposes a theory approach about the understanding of research about design as practice of aesthetic reflection and inherent part of research by design work, contributes with a condensed insight into the interdisciplinary discourse about design thinking – the research from within the discipline – and shows the different formats of the cluster: workshop 1 to 3 including seminars, exhibitions and colloquium – taking place in the beginning, in the middle and at the end of each cycle. 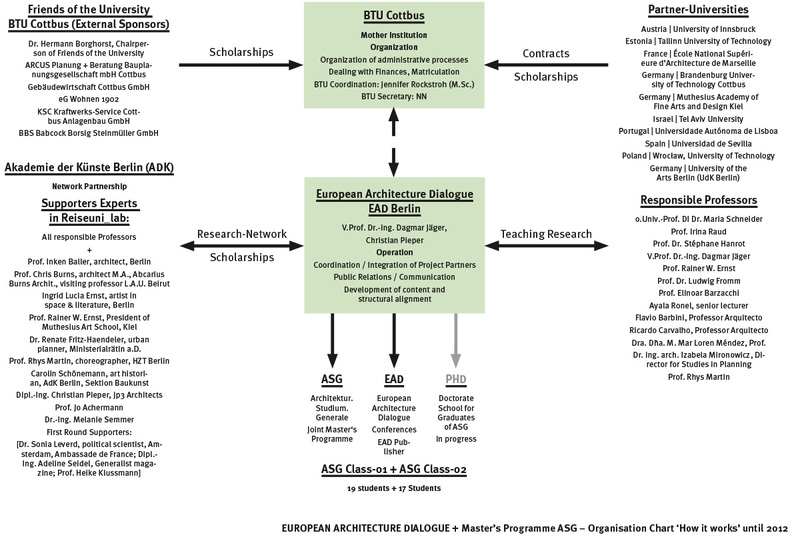 This cluster is an integrative and linking part of the programme, including the European Architecture Dialogue, the research exchange of professors and students about implemented and experienced design strategies, programmes and results. The cluster includes objectives, tasks and results and contains an introduction in teaching goals and research expectations. 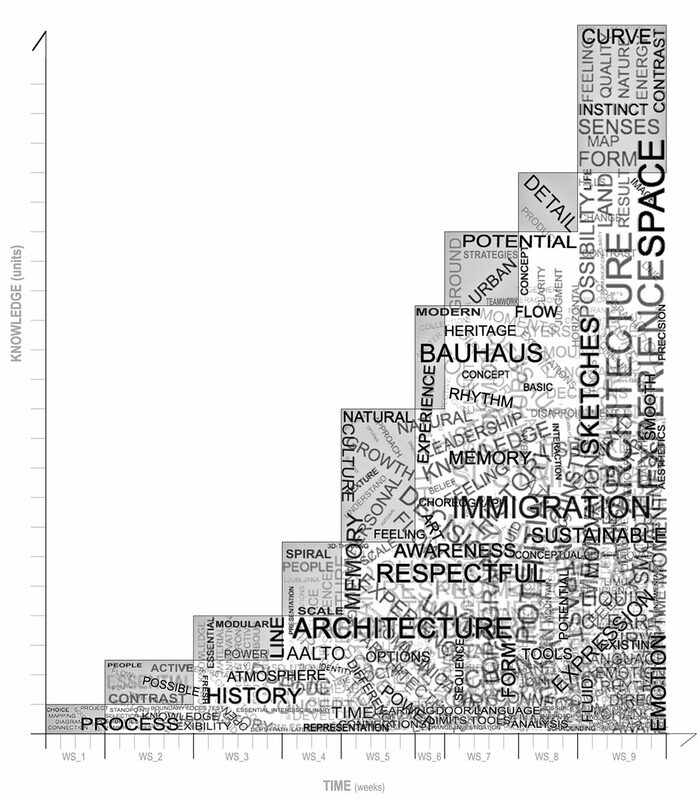 The aims and an overview of the 5 conferences of the format European Architecture Dialogue you will find in Volume:I.1, explaining the activities of the Reiseuni_lab and the pilot project. The Cluster Master's Thesis [Vol:III.12] shows an individual result of each student of class 01, which has been developed based on the knowledge worked out in the workshops, in dense contact of a research group, the so called research cluster, dealing with one topic and problem, to be investigated in a first period together as already trained in the workshops, and an individual solution worked out in a second period. The Master's thesis cluster shows not only the results of 5 different research groups who worked during half a year on one problem in deep and in multi-perspective results and in the different countries of the partner universities, but also gives an insight into the collective framework of the didactic intention, development and scheduling of this extraordinary period of dense cooperation of the international group of professors and students, to enlighten a local topic within a European Master's thesis research. The 16 workshops and a half-year research work resulted in an incredible amount of material, knowledge and site-specific experiences of all participants. The format of the posters, 1 to 1 meter, has been fixed from the beginning on for several reasons: to document the workshop results of each group and the short texts within a given limitation – the needed motivation to reduce the total process material, the working results during one workshop. Moreover, the limited format choice has been a precondition to develop a comparable and discursive format for debate and presentations as exhibitions during the programme. Finally, this format has been important for the accompanying publishing of the results on the blog and the Reiseuni Report, respecting the different conditions of horizontally or vertically oriented visualization. The poster design itself was mostly realized at the end of each workshop, reworked partly at the end of the workshop series in the frame of Design Method 2. They document a learning process of each of the students in their individual representational, visual and communicative means and understanding of the objective of each workshop strategy. My final recommendation for the reader: Enjoy the voyage through the European cultures, the architectural research approaches, the diverse architectural positions, the European research about shared problem fields and the treasure of multi perspectival answers, you will find throughout the volume – as student of architecture, as professor, architect or related expert, looking for a special way to deal with a problem, which in the meantime might have been resolved perhaps – or has been approached as a small step further towards a better solution of our living environment.